Football news: Arsenal sign Newcastle defender Debuchy. Arsenal sign Newcastle defender Debuchy. Arsenal splash cash on Mathieu Debuchy. Arsenal has added Newcastle defender Mathieu Debuchy to its list of acquired transfer targets this summer for a fee believed to be in the region of £18 million. The French man is expected to be a good replacement for Bacary Sagna, who left the Emirates stadium to join Premier League champions Manchester City on a free transfer. "I'm very proud to be joining a great club like Arsenal and to wear its colours, its one of the biggest clubs in the whole world. "I am looking foward to working with Arsene Wenger and to helping the team build on last season's FA cup success.Playing again in the Champions League is a big excitement for me and i will do my best to help Arsenal compete for trophies". 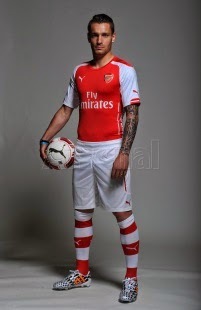 "We are delighted to welcome Mathieu Debuchy to Arsenal FC. "He has shown he can perform at the highest level with his club sides and also for France.He is a quality defender who has good Premier League experience and i am confident he will fit on very well with us". Debuchy becomes Wenger second involvement in the transfer market, following the arrival of Alexis Sanchez from Barcelona.